We can embroider your custom shirts, hats, polos, hoodies and more. 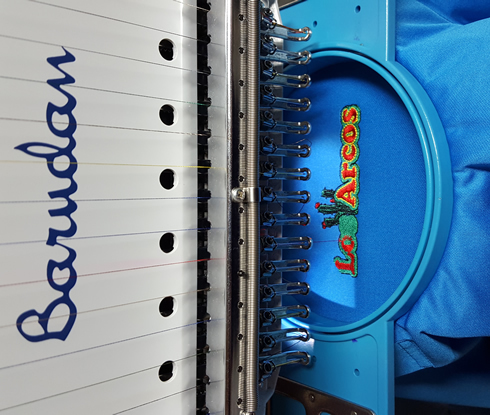 Embroidering a garment requires that the artwork be "digitized" to translate it for the embroidery machine. This digitization is a one-time fee that will be incurred on your initial order. An average embroidery job requires about 5,000 stitches. Our embroidery pricing is based accordingly, and additional stitches are priced per 1,000 stitches. We are happy to provide advice for you, so please contact us if you have any questions about your application or custom shirt/garment selection. Dixie Designs is a screen printing company located in Boaz, Alabama. We offer screen printing, embroidery and design services. © Copyright 2016 Dixie Designs. All rights reserved.